Deputy Attorney General Rod Rosenstein listens during a Supreme Court confirmation hearing before the Senate Judiciary Committee earlier this month. 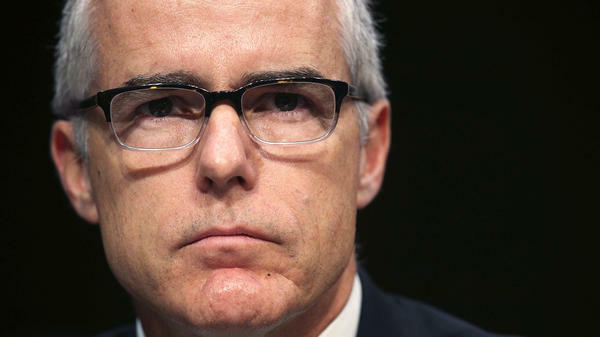 Onetime Acting FBI Director Andrew McCabe's lawyer said on Friday that he had given the memos at issue to special counsel Robert Mueller but not to the media. Somebody, for some reason, wanted The New York Times — and the world — to know about a conversation early in the tenure of Deputy Attorney General Rod Rosenstein about President Trump, the FBI and the Russia investigation. Per the Times' initial take, Rosenstein said he wanted to secretly record Trump. But when the follow-up takes appeared, their accounts made it sound as if Rosenstein said something more like this: Whaddaya wanna do, go see Trump and wear a wire!? Similar words, different inflections — very different meanings. How could the accounts miss such an important distinction? One possibility is that before this was a brawl, it was a game of "Telephone" and people at different stages were delivering different interpretations of purple monkey dishwasher. One original source for the account may have been a memorandum written by then-acting FBI Director Andrew McCabe, who was keeping his own set of written records of what he experienced — just as his former boss, onetime FBI Director James Comey, had since his first meeting with Trump. McCabe's lawyer said on Friday that, yes, the former G-man kept such memos and that he has given them to special counsel Robert Mueller but he had not given them to the Times. Somebody did, though — or somebody who has read them then described them to the Times. Did McCabe misunderstand Rosenstein when he wrote them? Or did whoever wanted McCabe's account out in the open not characterize to the Times that McCabe had written that Rosenstein was being facetious? Or did whoever wanted McCabe's accounting out in the open realize that McCabe had documented Rosenstein's comments as made — but not want the public to know that Rosenstein was being facetious? That distinction is critical because Rosenstein has been sitting on top of a volcano for months. Trump doesn't like him. House Republicans don't like him. They want him gone, and there have already been a few microcrises before this that looked as if they might turn into a flashpoint. In short, whose enemies were responsible for the Times report: Trump's or Rosenstein's? Rosenstein himself denied the story and said he thought it is clear the origin of this was with people "obviously biased against the department and ... advancing their own personal agenda." 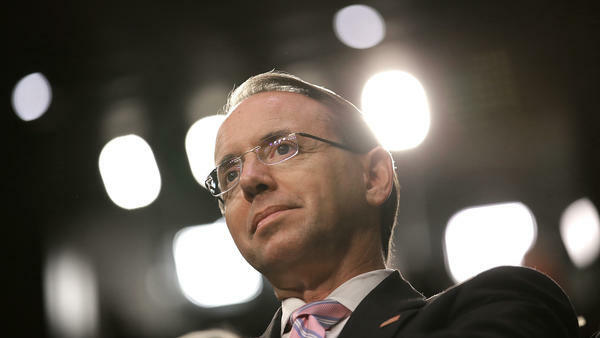 In a second statement released by the Justice Department on Friday night, Rosenstein specifically addressed suggestions he wanted to record the president and again touched on the reporting from the Times that the 25th Amendment, on presidential succession, was discussed. "I never pursued or authorized recording the President and any suggestion that I have ever advocated for the removal of the President is absolutely false," the deputy attorney general said. So are Rosenstein's days numbered? Maybe. Or maybe, as legal affairs analyst Khan Noonien Singh might have said, the goal wasn't to kill Rosenstein. It was to hurt him — and go on hurting him. The Times story creates a situation in which the president and his allies can say to their supporters: Look at these crooks! Look at how badly they've been discredited! They're quote-unquote investigating us? The White House only needs to maintain from now until the midterm elections, according to one theory of the case. The leaders of the Senate Judiciary Committee have expressed a new openness about confirming a new attorney general after Election Day. Trump — who says he has no attorney general right now — could dump Jeff Sessions and replace him with someone who isn't recused from the Russia investigation. That new boss of the Justice Department could wrest control of Mueller's office from Rosenstein, or at very least, get read in about what it is doing and begin to brief the president. Sean Hannity wanted him to do it. Lou Dobbs wanted him to do it. Jeanine Pirro wanted him to do it. But President Trump decided Friday that he's going to hold off for now on the next round of the Washington, D.C., document wars. This has been the year of the paper salvo. Republicans opened fire with the House intelligence committee's now-famous memo. Democrats answered with their countermemo. Trump and Republicans then escalated the war by releasing a seldom-seen application for a surveillance warrant submitted to the Foreign Intelligence Surveillance Court. They are on the verge of doubling down with more documents including pages from a partly unredacted version of that warrant application — but Trump has decided, for now, to save this card to play for another day. Trump said on Twitter that although he retains the authority to declassify whatever he likes, he has asked the Justice Department's inspector general to look into the material he wants to release. When that work is complete — or, who knows, maybe not — only then will the White House or its allies in Congress release the materials. Trump also told Hannity that he is aware that foreign partners of the United States are leery about unredacted intelligence documents being released. There have already been indications about how badly the release of these secrets has affected the spy business, but they haven't proven to be serious enough impediments in the past and there is probably no reason that would change now. For now, even though warnings by the leaders of the FBI and other national security officials usually don't move the needle with the political players in this drama, the top Democrat on the Senate intelligence committee found some rare words of approval for Trump on Friday after his comments about the role of the Justice Department's IG. "This is is why the president should be relying on the advice of intelligence and law enforcement professionals, not cable news hosts," said Virginia Sen. Mark Warner. Trump and supporters are pushing the storyline that partisan agitprop from Democrats, in the infamous Russia dossier, is the basis for the whole investigation. That isn't so. But because of the dossier's extreme claims and because it is partly unverified — and no one knows what parts of it the FBI has verified — it's the most effective target through which to try to weaken the whole foundation of the Russia investigation being conducted by the special counsel's office.